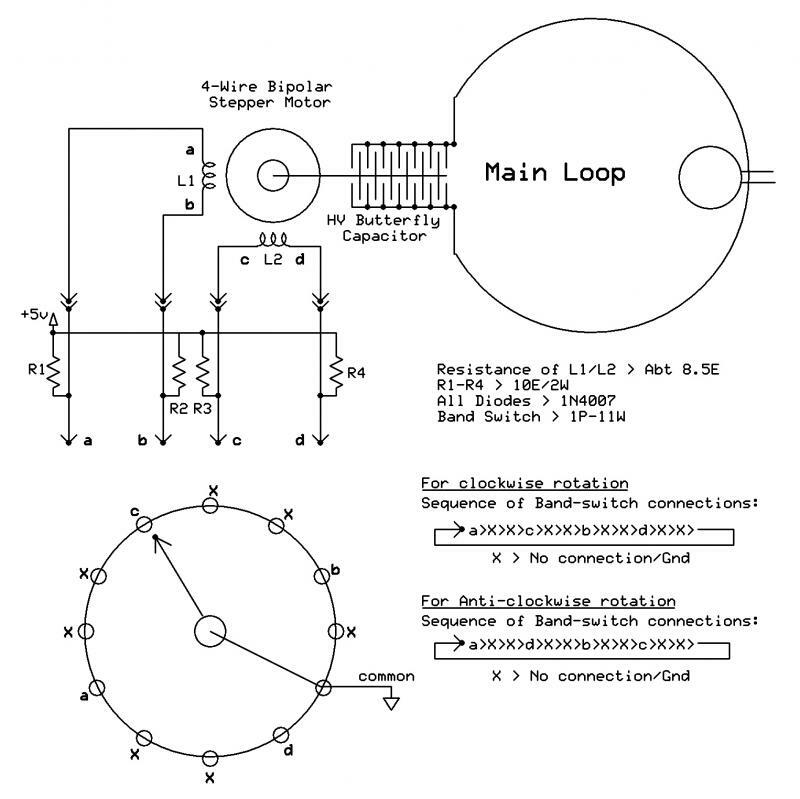 The most critical part in making a small Magnetic Loop Antenna is the remote tuning of high voltage variable capacitor. Some hams use DC Motors with high-ratio gear-box and control circuits, while other prefer Stepper Motors (SMs). I like SMs as they have no overshoot problems, having excellent low speed torque characteristics, run in controlled steps in both the direction and most importantly- these are available in abundance in obsolete printers / scanners/disc drives etc. The only scary part of SMs is the number of wires coming out of motor – 4, 5, 6 and even 8! Unlike DC Motors these have to be connected to suitable drivers and fed with pulses in a particular sequence to make them run the motor in steps in any desired direction. A number of SM controller ICs are available in the market to do this job. Depending upon the type of SM used (Unipolar or Bipolar – more of it a little later), a minimum of 2 to 3 ICs along with associated components and circuits are required for controlling the SMs. These digital controller-drivers generally have two push-button switches to control the direction of motor in clockwise or anti-clockwise direction; one pot to control the speed of rotation and one or more LEDs for status indication. They do not have a knob type tuning control! 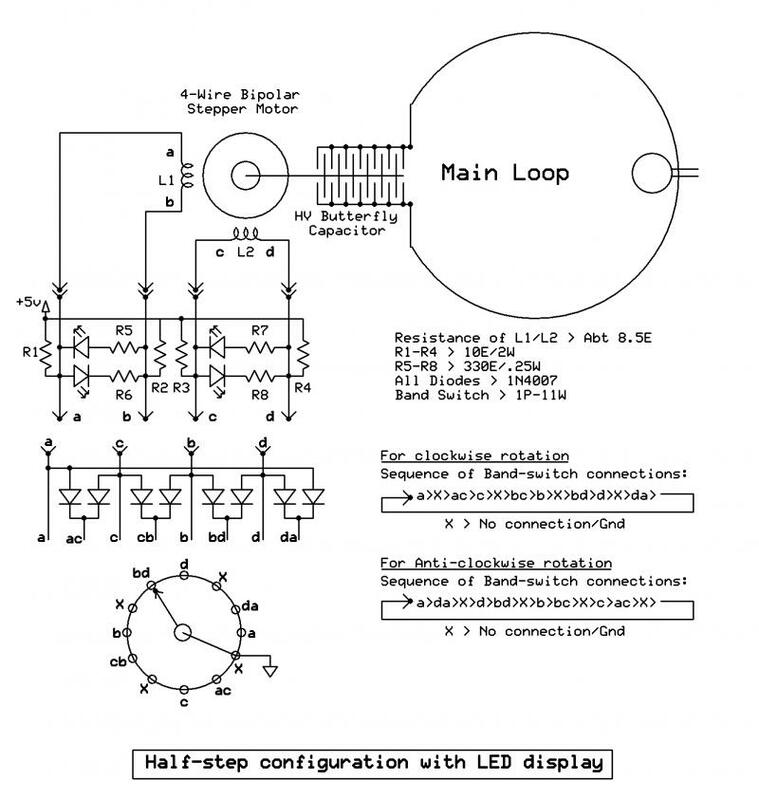 So here are world’s simplest, smoothest and the cheapest controller driver ideas for stepper motors for Hams applications – especially for remote tuning of loop-antenna. These controllers have that wonderful analog type tuning feel and the simplest one requires just a band-switch (for Unipolar SM), a band-switch and 4 resistances (for Bipolar SM)! The advanced version requires additional 4 LEDs!! Fig.1 shows a typical SM you can salvage from an old printer. If it has 4-wires coming out, it will essentially be a Bipolar type. 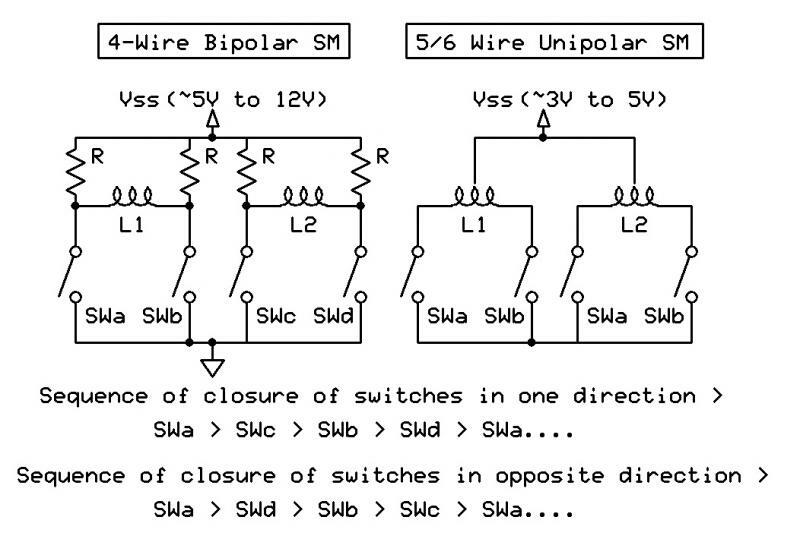 5-wires and 6-wires steppers are normally Unipolar types. You can check, identify and mark the wires by checking the continuity through a multi-meter. Typical coil resistances range from 5 to 10 ohms. The SMs are permanent magnet motors which can be rotated in both the directions in precision angular steps. 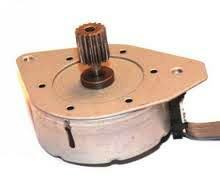 When not rotating, they have some holding torque, that is, their rotors do not slip or rotate by themselves. We shall make use of this property to our advantage. The SMs are available in a variety of step sizes per revolution. The common ones are – 200, 180, 144, 72, 24 & 12. These correspond to 1.8, 2, 2.5, 5, 15 & 30 degrees of rotation per step. We can also manipulate the drivers to have double the number of steps for finer control. For example, a 1.8 degree SM can also be made to rotate in 1.8/2 = 0.9 degree steps. Unipolar motors are simpler to drive. They require only one power supply source. Fig 2 shows 5 & 6 wires unipolar SMs connections. Note that both the windings have centre taps. These taps are connected to positive power supply; 3.6V or 5V or 12V, depending upon the rating of the SM. The ends of the windings a, b, c & d are connected to four switches. These switches are closed in a particular sequence to rotate the motor in clockwise or anti-clockwise direction. Fig.2 also shows connections of a 4-wire Bipolar SM. Here the coils have no centre taps for supply connections. The drive circuitry for such a motor requires an H-bridge control circuit for each winding. An H-bridge allows the polarity of the power applied to each end of the winding to be controlled independently. 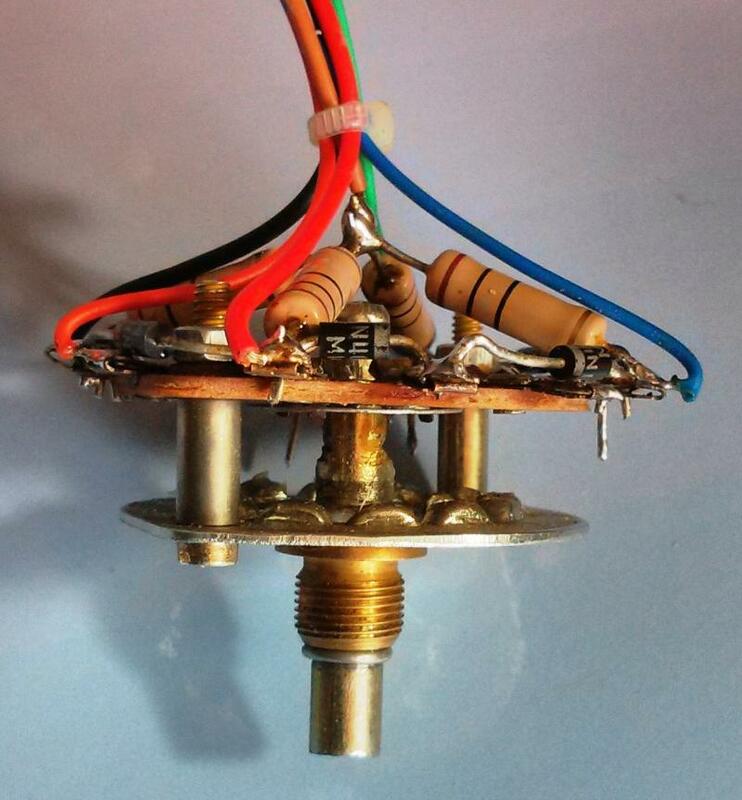 Picture shows the wiring details of 1P-11W band-switch. Eight 1N4007 diodes are used for half-step configuration. The common point of four 2W 10E resistances is connected to 5V supply. 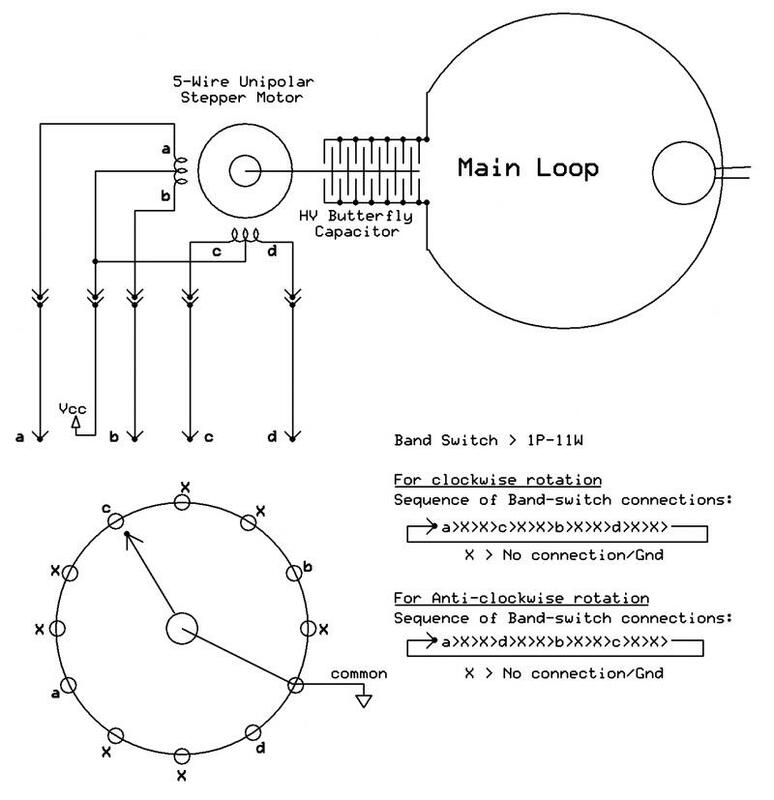 Out of 11 positions in the band-switch, 4 positions have been left unconnected. After tunning the stepper motor in the desired position, it is desirable to advance or back-off the band-switch by one position so that the band-switch wiper rests in unconnected pole. This will conserve power as SM will remain in the same tunned position. This position is easily detected by LEDs. All the four LEDs will go off when the band-switch wiper is on any of the vacant pole position. 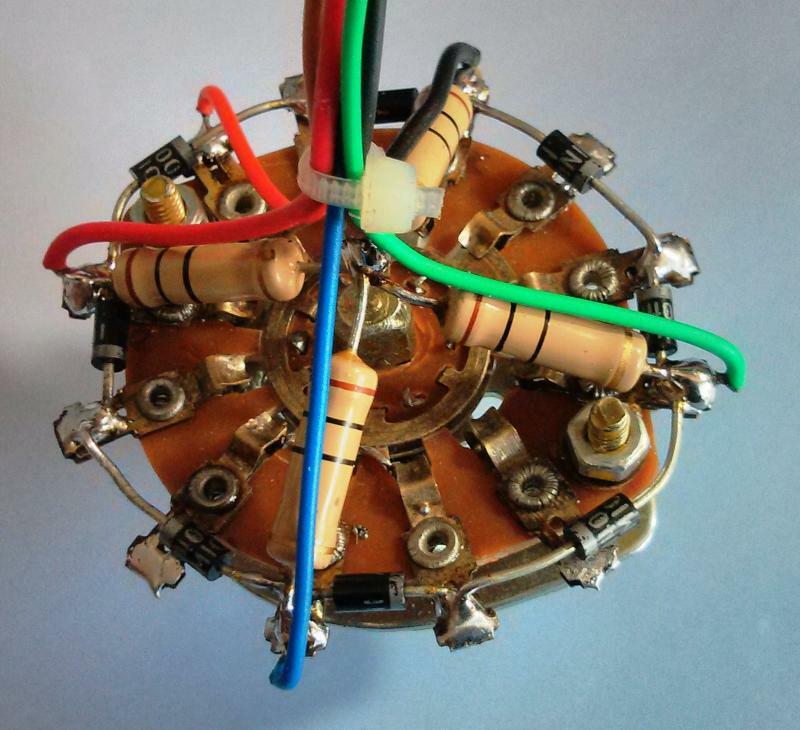 Side view of the band-switch. Steel spring, ball-bearings and guiding washer have been removed so that the shaft can be rotated smoothly in any direction.